My mom agreed to come stay the summer with us to help take care of my new baby boy while I am at work. It has been such a blessing to have someone I completely trust spend the day with my son, especially when he is this little. My daughter has been enjoying having grandma here in the evenings as well! Since it is summer break, we have developed a little ritual of watching Harry Potter in the evenings, with a big bowl of popcorn. Now, we don’t just eat any popcorn, we are making it fresh! A few months ago, I had a friend recommend this Popcorn Maker that makes air-popped popcorn in just a few minutes. There is no oil, no bags to throw away, no stinky microwave… it really is a wonderful appliance. And as a person who has owned a lot of useless kitchen appliances over the years, this one is certainly worth the investment. We have made popcorn almost every week since I bought it a few months ago, and I imagine we’ll use it for many years to come. Air-popping popcorn is also extremely economical. You can purchase almost 2 pounds of Trader Joe’s Organic Popping Corn (organic = GMO free) for under $10, and it’ll last a long time. It is literally one of the cheapest snacks I have made. I decided to venture out of the salt and butter popcorn (not that it isn’t amazing) and make some different flavors of popcorn. And because I love trying new recipes out, and decided I wanted to learn how to make cheddar popcorn. Like the kind of cheddar popcorn that comes in those large tins around Christmas time. I knew my daughter would love it! I found some organic powdered white cheddar on Amazon, and decided to give it a try! And it turned out great! I sprinkled some on top of the popcorn and it was a huge hit. 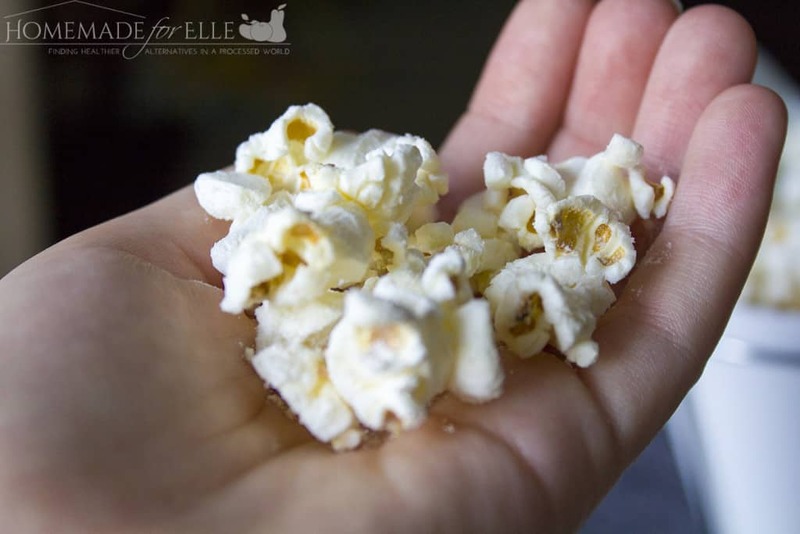 Tasted very similar to the Christmas tin popcorn, but it was all organic, fresh and I could control the amount of cheddar, butter and salt that went into the popcorn. So here it is. My tried and true cheddar popcorn recipe. I hope your family loves it as much as mine! 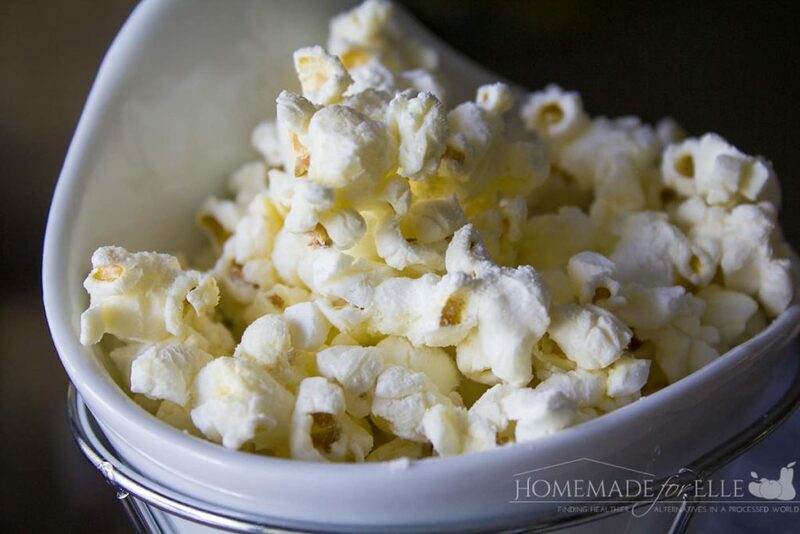 Slowly drizzle melted butter over popcorn. Sprinkle on cheddar and salt, and mix popcorn to coat evenly. What flavor of popcorn is your favorite? 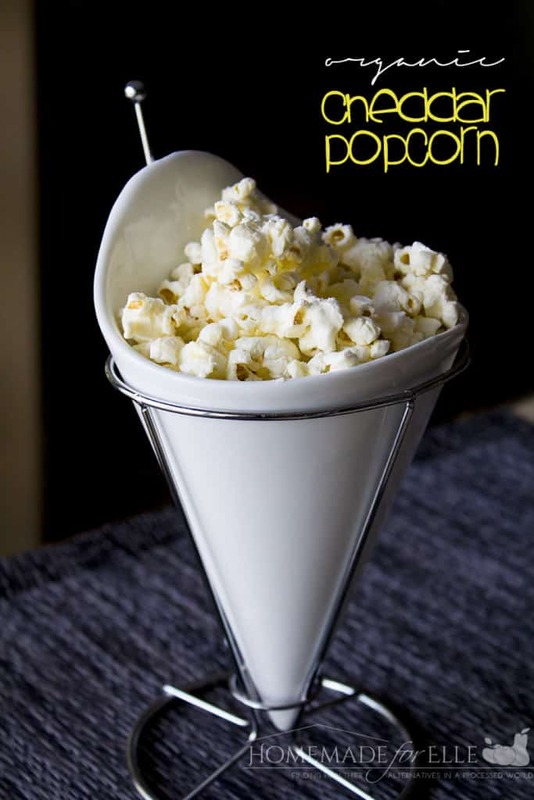 This is one of my favorite ways to eat popcorn! 🙂 Yum! Cheese popcorn is sooooo yummy! We have a local spice shop and I buy dry cheese seasoning to sprinkle on popcorn we make over the stove. We used to use an air popper. However, I was not certain the plastic was BPA free and there was no off switch. To turn the popper off I had to pull the cord out of the electrical outlet, it sparked every time. Needless to say I was not too comfortable using it. Now I just use a pot, oil, and my stove. AMAZING popcorn!! Have you ever just tried to cook popcorn over the stove?